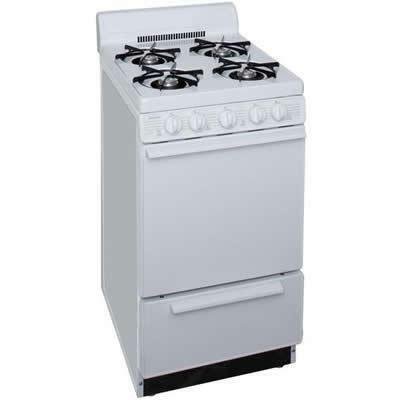 Premier 2.4 cu.ft freestanding gas range with 20 inches and 4 inches porcelain backguard. Easy cleaning with the standard clean oven and anti-tip bracket attaches to floor. Additional Information Spark gas pilot-electricity required; Easy cleaning with the standard clean oven; Anti-tip bracket attaches to floor. Additional Dimensions Shipping dimensions: 41.0 x 27.0 x 21.0. Warranty 1 Year. Lifetime for top burners.